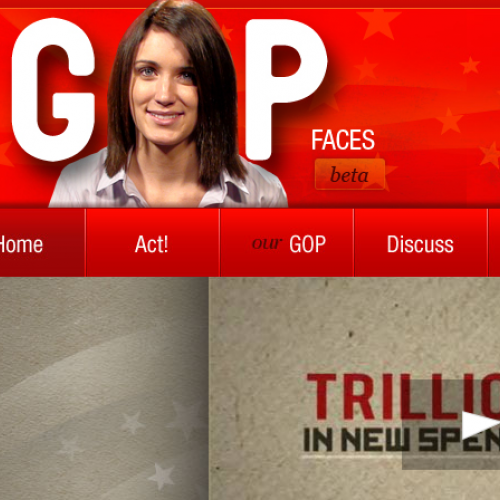 The Republican National Committee's new website, under construction through most of the spring and summer, has finally launched--or fizzled, if you were listening to the left wing blogosphere's collective guffaw. Pretty much every aspect of the site was immediately mocked, from typos (the "Iraw war") to the "future leaders" page (see below) to Michael Steele's new blog (literally, "What up"). So far, the GOP's obsession with catching up to Democrats online has been an expensive failure, with one-off gimmicks like sending "tea bags" and "welcome memos" to Democratic leaders or using an "Obamacard" to realize how big the stimulus was. The College Republicans have been particularly shallow; their main effort around health care is "Operation Waiting Game," which exhorts the young folk to compete for how many online "actions"--tweets, Facebook messages, etc.--they can take to stop a "government takeover." All of these efforts miss the point of online buzz: to make people take real on-the-ground action that wins minds, and then elections. Sure, Republicans always look absurd when they try to be "hip." And yeah, a spiffed-up GOP.com is all just gloss if the party doesn't come up with actual policies that appeal to their rapidly narrowing base. But in one very important way, the new site is a huge step for the GOP's tech strategy: they have finally provided a framework for people to connect independently of party organization. My.barackobama.com was so successful because it helped organizers find each other, acting as a huge magnifier for any staff time the campaign could invest. The social networking bit--"ourGOP"--looks to be an impressively flexible and interactive conservative Facebook, much more inviting than the old site's transparent attempt to bank your contact info. In the first day, groups are forming and events being posted, a step towards the thousands upon thousands of such entities that have been building over at Democrats.org since the election. Laugh all you want--just don't say they didn't learn something.